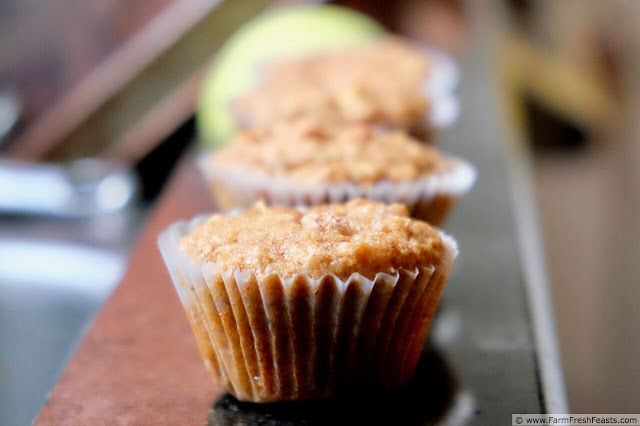 Buttery chunks of sweet fresh apple in a wholesome whole grain muffin. There's nothing better than a local apple, grown for flavor--not the ability to step off the truck looking enticing. I'm delighted to get an apple share with my Community Supported Agriculture (CSA) farm share. Just like berries in Spring, and melons in summer, we look forward to the changing of the seasons with the arrival of apples heralding the advent of Fall. This time of year I am the proverbial Ant of Ant and Grasshopper lore. I spend my days off harvesting, chopping, mincing, slicing, roasting, dehydrating, freezing and canning the local summer abundance. I do this for three reasons. First, I hate to waste food so permitting produce to spoil because I haven't gotten around to eating it is unacceptable to me. Second, I like to eat locally sourced food--and there's nothing more local than my backyard! Third, I'm a frugal sort. If I'm overrun with tomatoes in August, why not put them up now so I avoid paying money later when I want to make my Creamy Tomato Soup for my daughter's lunch? As is true in Life, I have a few exceptions to my rule of 'save it for later'. Apples are one of those exceptions (avocados are another--I know you can freeze them, but I've never tried. I just gorge myself). I realize that I am capable of canning applesauce or dehydrating apple slices . . . but I'd rather bite into a fresh apple. Since apples store a good long time in the crisper, the apple share of my CSA farm share invariably lasts longer than the farm share season (much like the contents of the Strategic Winter Squash Reserve). 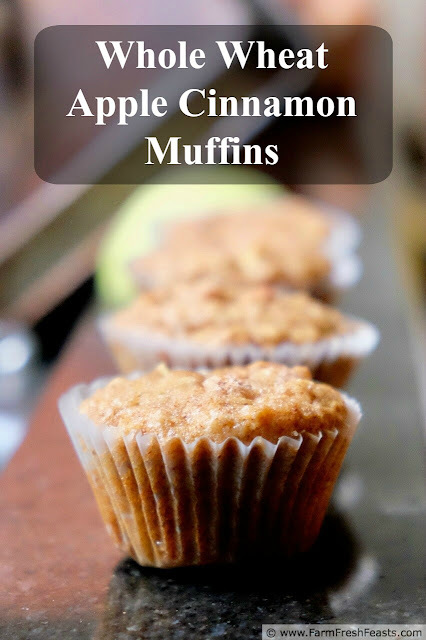 For more recipes using apples, please see my Apple Recipes Collection. It's part of the Visual Recipe Index by Ingredient, a resource for folks like me eating from the farm share, the farmer's market, the garden, the neighbor's garden, and great deals on ugly produce at the grocery store. Note: this recipe involves a wee bit of planning ahead. You need to soak the oats in buttermilk for at least an hour. I generally throw the oats and buttermilk into a pint sized canning jar in the fridge a day or two before I plan to make muffins. However, you can toss them together in a bowl on the counter and go check FB or take a dog for a walk if you'd prefer. In a large bowl, soak oats in buttermilk for one hour. You can prep this up to 3 days ahead. When you're ready to bake, preheat oven to 400 degrees Fahrenheit. Line a 12 well muffin pan with paper liners. Add egg, oil, brown sugar, and vanilla to oat mixture. Dump dry ingredients on top. Set aside. In a small bowl (or the measuring cup you melted the butter in) stir butter, cinnamon, sugar, and apple pieces together. 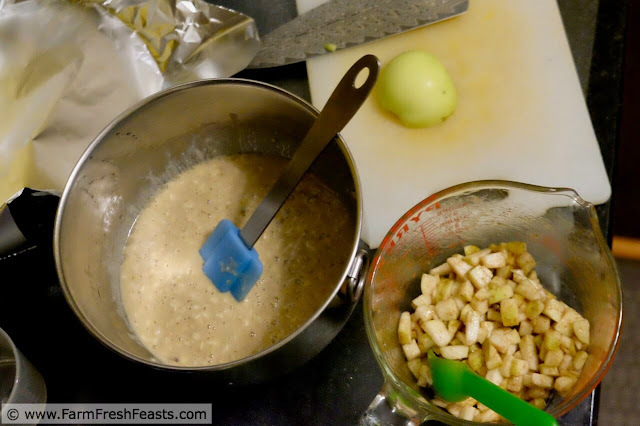 Briefly stir dry ingredients into oats. Add apples. Combine all ingredients until just moistened. Scoop into prepared pan, filling ⅔ to ¾ full. 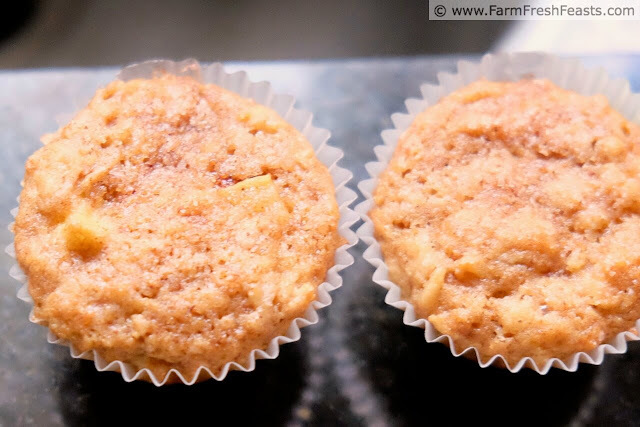 Sprinkle cinnamon sugar on top of muffins. Bake for 15 minutes in preheated oven. Cool in pan for 5 minutes. A woman after my own heart. We are much on the same wavelength with our attitude about food. Alas, I no longer belong to a CSA because being empty nesters now there was just way too much food and even with preserving what I could there was a lot of waste so now I just hit Farmer's Market in season each week. I still have a butternut squash from last fall that is hanging in just fine. Ha. I'm still loving on my peaches but I'm getting ready for apple season all the same. Apples do last a good long time in the fridge, don't they? Love them for that! 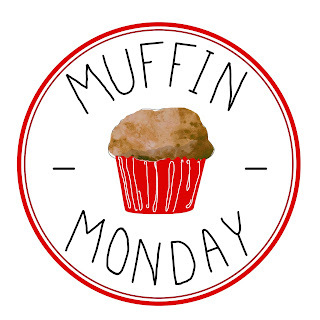 These muffins sound yummy! Soaking the oats in buttermilk is a great idea! 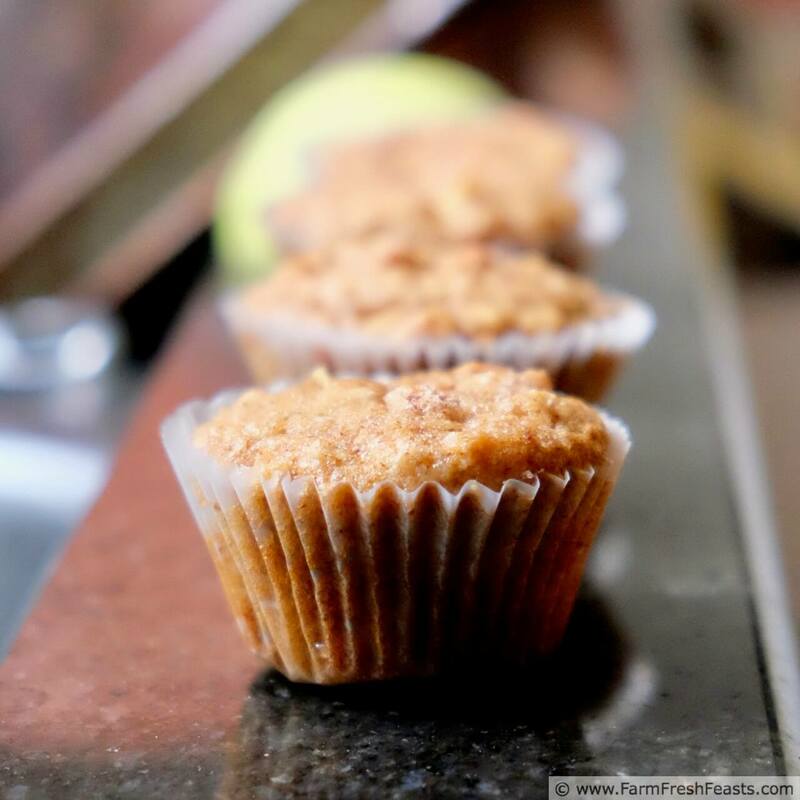 Can't wait to try these muffins.